I've never been to Disney's World of Color before. Located in Disneyland's California Adventure, it starts after the Disneyland fireworks are over, and it has always seemed just a little bit too late for my very young kids. 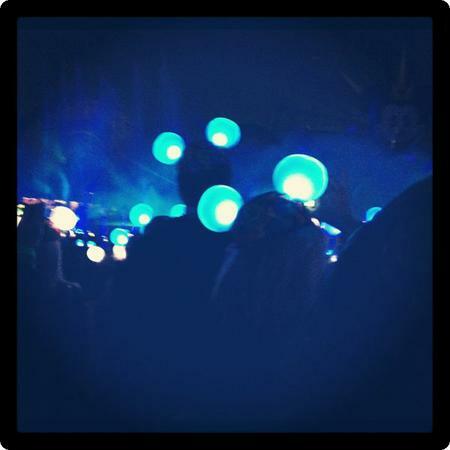 With them sound asleep in the hotel during the Cars Land grand opening, it seemed like a good time to enjoy the show. I was in for a surprise, the mouse ear hats we were all handed as we walked in (they're on sale to park guests for $25 each) received signals from emitters throughout Paradise Bay so that they would light up along with the light show. Being surrounded by all those hats made the dancing colors and lights seem that much closer - it was almost like being inside the show. Enter to Win Four California Adventure park passes so you can see Cars Land for yourself! walkingon travels on June 28, 2012 at 9:43 p.m.
That's pretty wild. Not sure I could have walked away without a migraine, but I'm sure it was really cool to look at. Thanks for hosting another great Photo Friday! Nancie on June 28, 2012 at 11:05 p.m. Sounds like it would be lots of fun. Great shot! Allison on June 29, 2012 at 7:27 a.m.
My husband and I also saw World of Color after Grandma put the kids to bed. It had just opened, and the light-up ears had not yet been introduced. It looks like an impressive sight. Mara on June 29, 2012 at 11:26 a.m. I'm impressed you had the energy to do this! I think I might have been asleep back at the hotel with the kids. Looks like it was really cool though. Crystal Lewis on June 29, 2012 at 2:06 p.m.
My first time joining you at Photo Friday, and I think I put my post up twice! So sorry, silly new girl!! You can remove #26 as its a duplicate. Thank you so much!